April has been an exciting month! We had a great turn out at our Sparring Session! Every participant did an amazing job. This past weekend we had over 60 participants at our 2nd Annual WMAA Grappling Games! All the participants went out and gave it their all! We had a great time and are privileged to have such amazing students. April isn’t over yet! On April 28th we’ll have our Grand Opening of the East Flower Mound Location! Come check it out from 10-1 pm! Way to go Comp Team! What a great turn out for the AGF Tournament in Oklahoma! We had almost 30 competitors come out to compete. The team placed 2nd overall at AGF! Way to go Warriors!! Our next competition will be a NAGA on May 5th in Dallas. We had a great time teaching the students of Pink and Miller Elementary during PE class last month! Our Warrior Instructors came in and led amazing high energy classes. They showed the students basic martial arts techniques including: punches, kicks, and take-down set ups. We enjoy being a part of our communities and being allowed to contribute to the physical fitness educations of so many Frisco ISD schools in our area! We had Robson Moura, a 5th degree Black Belt and an 8-time world champion, at Warrior Martial Arts Academy to teach Seminars this month! He taught our competition kids some great technique that they will be able to use when the compete at NAGA in December. But he didn’t come from Florida just for our competition kids, he lead a great adult seminar as well. Professor Moura worked with many students, including our Instructors, at both the seminars. We are so glad he was able to come out and pass on his knowledge. Congratulations to Ryan Jung for being Warrior Martial Arts February Student of the Month. Ryan Jung has been doing Martial Arts with us for many years. Ryan Jung is loyal, respectful, and most of all ambitious. When Ryan competes in Brazilian Jiu Jitsu he always places in his division! Not a day goes by where this young man does not give 100% to whatever he is doing. Ryan is not only dedicated to Martial Arts, he has been on the same soccer team since he was four years old and plays the oboe in his school’s band. There is not limit to the amount of success this young man will achieve with the support system behind him. WARRIOR MARTIAL ARTS ACADEMY TAKES 1ST PLACE IN THE KIDS AND TEENS DIVISION!!! FROM ONE OF OUR AWESOME COACHES: Professor JD Shelley! Results are in from NAGA World Championships Dallas 2016…. Congratulations to all the Lil’ Warriors who fought their hearts out a couple weeks ago!!! Warrior Martial Arts Academy was kind enough to hire me on in Little Elm and Frisco locations May 2016. I was pleased to see just how many young athletes were already training at WMAA and new right away this was going to be a good fit for me. With TEAMWORK and ZERO EGOS we were able to achieve a goal that I’ve been chasing since 1st having my students compete at NAGA from NDBJJ. Closest NDBJJ/NDMMA came was 3rd place team placement with less than 10 children (forgot what year). With this many kids and the support from our WARRIOR Parents, friends, Professors and Owners we were able to achieve our goal. Proud of our students and coaches. Amazing job everyone. Bring a friend to any of our classes all week for free at both of our locations! Come visit us at our free Back to School bash at either location. There will be lots of fun activities alon with a visit from one of our special friends a real Avenger. Warrior Martial Arts is excited to announce that Professor JD Shelley will be joining the Warrior Martial Arts family in Frisco and in Little Elm. He will be working with both kids and adults. Professor Shelley has been training in Martial Arts for over 3 decades. He is a 3rd degree Black Belt under Robson Moura. JD is also a United States Marine Corps Veteran (Desert Shield, Desert Storm, Desert Saber), trainer of law enforcement and military personnel and trainer to numerous professional and amateur fighters. Warrior Martial Arts is thrilled that JD will be joining our team of great Martial Arts instructors. In a culture that seems to glorify violence in everything from music to video games and television shows, the idea of enrolling your child in martial arts training classes doesn’t always seem like a good one. While martial arts-centered action films seem to be filled to the brim with violent behavior and gory injuries, you may be surprised to learn that martial arts’ training is actually very beneficial to kids. Like so many other things that Hollywood doesn’t always get right, martial arts isn’t quite the brutal, vicious pastime that it seems. 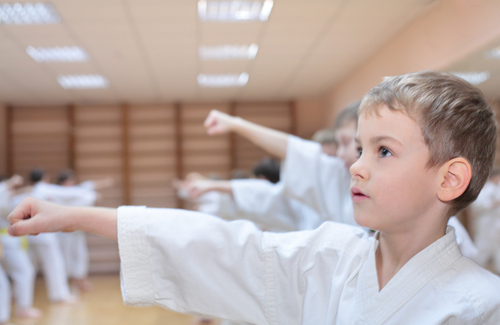 In fact, these are 10 of the reasons why you may want to consider martial arts training for your kids. Fostering Self-Discipline – One of the central tenets of all forms of the martial arts is an absolute focus on self-discipline. Today’s kids are so accustomed to receiving instant gratification that lessons in self-restraint and discipline aren’t always easy to come by. Kids with a martial arts background, however, are continually reminded of how essential self-discipline is. Boosting Socialization Skills – Kids who don’t always thrive in highly social environments may find it easier to get to know people and make new friends when they’re in a room filled with peers who share a common interest. The kids on the playground may not always have much common ground, but devotees to the martial arts are able to get to know one another through shared pursuits. Partner-driven forms like jiu jitsu can also foster camaraderie, as they force kids to pair off and build their skills together. Encouraging Physical Activity – Limiting screen time is a great idea when it comes to getting kids off the couch and encouraging them to be more active, but it only goes so far. Enrolling an inactive child in such a physically demanding pastime not only discourages the sedentary lifestyle she’s used to, but also gives her an enjoyable activity that inspires her to keep moving. Learning to Set and Achieve Goals – Most forms of martial arts are based around an accomplishment system of colored belts that signify the wearer’s degree of skill. When your child strives toward each new belt, he’s learning valuable lessons about setting and reaching his goals. Increased Self-Esteem – Confidence comes with achievement, so your child’s self-esteem level will get a boost with every new move he masters and every belt he earns. Kids who struggle with a low sense of self-worth usually become more confident as time progresses while they’re enrolled in a martial arts class. Instilling a Sense of Respect – Learning any martial arts style will require your child to show her instructor unflinching respect. Today’s kid culture doesn’t always include respect for authority, adults or those in advanced positions. When she goes to her karate or tae kwon do class, though, your child will be learning lessons in respect along with new moves. Encouraging Non-Violent Conflict Resolution – Thinking that martial arts instruction promotes violent behavior is justified if your only experience with the activity comes from television or movies. In fact, many defensive styles teach kids peaceful, non-violent conflict resolution skills and emphasize the importance of avoiding a physical altercation. Improving Listening Skills – In order to master the skills she’s being taught and advance through the belt ranks, your child will have to exercise superior listening skills. Kids who aren’t always adept when it comes to paying attention to what they’re told can benefit from the verbal instruction and one-on-one work in her dojo. Developing Teamwork Skills – Whether he’s breaking boards to get a new belt or sparring in a practice setting to master a new maneuver, there are few things that your child does in his martial arts classes that will be done on his own. Working together to learn new things and accomplish goals is an important life lesson for kids to learn, and instruction in the martial arts can help your child learn that lesson. Improvement in Other Areas of Life – The benefits of martial arts training don’t end in the dojo. The boost in confidence, increased fitness level and new cooperation skills will also help your child navigate the academic and social aspects of school, affect his behavior at home and have an all-around good influence on him as he develops into an adult. If you’re still concerned about encouraging violent tendencies or teaching your child to fight, it may be helpful to visit a few dojos/gyms in your area. Speak with the instructors, administrators and other parents to get an idea of how things operate, and hold off on forming a negative opinion of the martial arts until you’ve done a bit of exploratory research. You may even find that training is the perfect activity for your entire family to do together! Keep up to date with our upcoming events at both locations! Offer to all new visitors. Martial Arts Classes Mixed Martial Arts and Karate Frisco & Little Elm - Warrior Martial Arts Academy has classes for kids, adults and families. Awesome for beginners. Self-Defense, Fitness and more. Free Trial to explore martial arts. Martial Arts Classes Mixed Martial Arts and Karate Frisco & West McKinney - Warrior Martial Arts Academy has classes for kids, adults and families. Awesome for beginners. Self-Defense, Fitness and more. Free Trial to explore martial arts. Martial Arts for Kids Frisco | Martial Arts for Kids Little Elm | Kids Martial Arts Frisco | Kids Martial Arts Little Elm | Martial Arts School Frisco | Martial Arts School Little Elm | If you have done a search for kids martial arts classes near me and you found Warriormartialartsacademy.com you will not be disappointed. Copyright 2018 Warrior Martial Arts Academy. All Rights Reserved.